Peter Callahan, just got accepted by the IAAF to compete for Belgium at the European Championship and Olympic Games (if he runs the A standard)! No reference, so of course, I questioned it. The best way to answer it would be to hear it straight from the Princeton alumnus’ mouth. Fortunately, Peter was good in responding to my facebook message asking him about the truth to this statement. 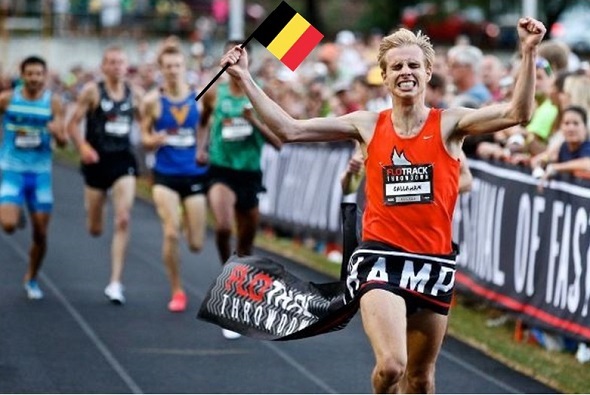 “Yup it is true, I have decided to represent Belgium at future international competitions,” was his message as he linked me to his official announcement through Flotrack that was published earlier today. He will be running for Belgium with goals of meeting the Olympic standard in the 1,500m (3:36.19) by July 11th in order to be selected for the Olympic team for Belgium. He will continue to train with the Princeton men’s distance coach Jason Vigilante in New Jersey as he preps for the European Championships on July 6th to 10th in Amsterdam. As of right now, Callahan’s 1,500m PR is 3:37.87 that he ran at the Swathmore Last Qualifier Meet from a few weeks ago. Can he meet the standard with a month and a half left in the qualification window? We hope so and we wish him the best of luck. This entry was posted on Wednesday, May 25th, 2016 at 7:00 pm. It is filed under Alumni, Spotlight. You can follow any responses to this entry through the RSS 2.0 feed.